Protoje was the featured artist at the 3rd installment of Dubwise Atlanta held at WildPitch Music Hall on December 4, 2016. Get Protoje’s latest “Royalty Free” project here. Read more about Dubwise here. Powered by #rubadubatl. Read more about Rub-A-Dub ATL here. 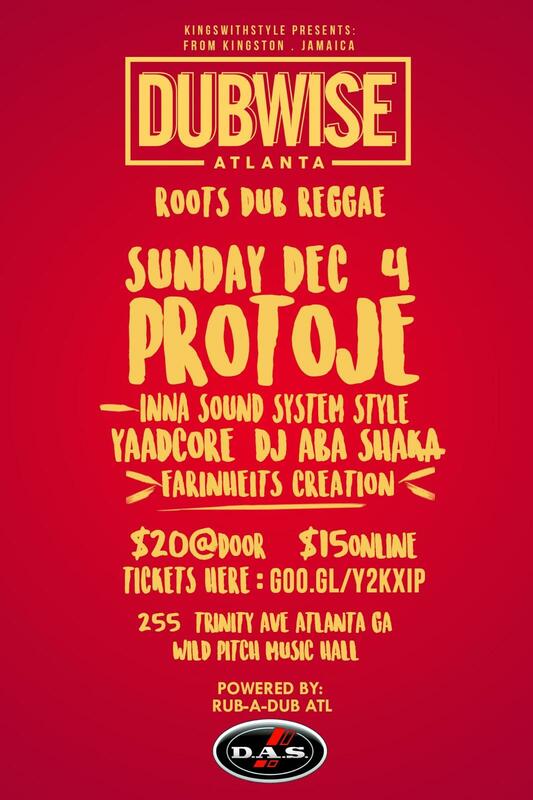 Get the full audio from DUBWISE ATLANTA FT. PROTOJE here. View the full DUBWISE ATLANTA WITH PROTOJE PICTURE GALLERY here. Dubwise Atlanta presented by Kings With Style Co.
Kings With Style presents: live from Kingston, Jamaica, DUBWISE Atlanta featuring Yaadcore (#dubwisejamaica) with Protoje performing inna sound system style. Powered by #rubadubatl (every 2nd Sunday @WildPitch). Sound System provided by D.A.S. Audio. $20 at the Door / $15 Online. Doors 8pm-12am. Producer and engineer Bulby York rallies Jamaican superstars – Beres Hammond, Bounty Killer, Agent Sasco (Assassin), Lee “Scratch” Perry, Jesse Royal, Maxi Priest, Cherine, Sizzla, Busy Signal, Lutan Fyah and more – for his debut album “Epic & Ting,” released May 13, 2016 on VP Records. Bulby’s sound spans multiple genres – merging reggae, dancehall, dub and EDM into a style of his own. The project has consistently been receiving spins on BBC Radio 1, BBC 1Xtra, Capital XTRA & much more! As one of Jamaica’s most in-demand studio men, the Kingston-born producer has put his touch on signature dancehall records by Sean Paul, Bounty Killer and Beenie Man and also worked with the who’s who of pop music, including No Doubt, Rihanna, Britney Spears and Madonna. After years of bringing other people’s projects to life, Bulby now has a masterpiece he can call his own in Epic & Ting. Compilation Features Covers from Marsha Ambrosius, Freddie McGregor, Maxi Priest, Romain Virgo, Ikaya, Raging Fyah, Jah9, Christopher Ellis, The Green, Katchafire, Jah Cure, No Maddz, Chronixx, Jesse Royal, Kabaka Pyramid, Exco Levi, Kelissa, Jahmiel, Iba Mahr, Keznamdi and more. Hailed by NPR Morning Edition as one of the 50 great voices of all time – the Jamaican musical icon Dennis Brown began his recording career at the tender age of 11 and released more than 75 albums during his all too short 42 years on Earth. Although the reggae legend passed away in 1999, his music and legacy live on. VP Records, the world’s leading reggae label, will pay homage to Brown on June 3, 2016 with an extensive tribute album of his timeless hits and deep cuts titled, We Remember Dennis Brown. The 30-song collection features a wide and impressive range of reggae and R&B voices covering crucial Dennis Brown compositions. The set was produced by Jamaican legend Clive Hunt with an all-star team of musicians. In February (Brown’s birthday month), VP Records premiered one song from the album every Friday for five weeks – including “Caress Me” from one of Jamaica’s brightest voices Romain Virgo, “Milk & Honey” by roots reggae rockers Raging Fyah, “Bloody City” from the Caribbean’s soulful songstress Jah9, “Promised Land” from Hawaiian reggae band The Green and “Have You Ever” by R&B powerhouse Marsha Ambrosius. In addition to these power hitters, We Remember Dennis Brown will feature an array of singers from Brown’s native country and across the globe who he influenced. Jamaica’s latest crop of stars (including Jah Cure, Gyptian, Iba Mahr, Kabaka Pyramid, Kelissa, Keznamdi, Chronixx and Jesse Royal) as well as the island’s icons who worked with Brown (like reggae vocalists Bushman and Freddie McGregor) all offer their contributions. Freddie’s son Chino McGregor and Christopher Ellis, the talented UK-based singer and offspring of Alton Ellis (another one of Brown’s musical mentors and confidants), both deliver powerful renditions of Brown’s classics. New Zealand rockers also create a breezy rendition of “If I Had The World.” The worldly collection proves that his universal sound transcends all boundaries of time, race and creed. Each artist adds their own original flair to Brown’s profound soul-stirring sound – touching the hearts of new and old fans alike on this unique multi-disc collection. We Remember Dennis Brown will include deluxe packaging as well as extensive liner notes on the belated legend. Dennis Brown was greatly influenced by American balladeers such as Sam Cooke, Frank Sinatra and Dean Martin as well as Jamaican singers like Delroy Wilson and John Holt. At only 12-years-old, he cut his first hit “No Man Is An Island” at Clement “Coxsone” Dodd’s famous Studio One. Within the years, he was a force to be reckoned with musically – dubbed the “Boy Wonder of Jamaica” and “Crown Prince of Reggae.” Before he was 16, he had worked with Jamaica’s top recording artists (Alton Ellis, Horace Andy) and producers of the time (Prince Buster, Dennis Alcapone, Winston “Niney” Holness and Vincent “Randy” Chin). In the 1970s, he worked closely with producer Joe Gibbs and released multiple albums. One of the album’s songs “Money in my Pocket,” peaked at #14 on UK Top 40 chart becoming one of the biggest international hits in Jamaica’s history. This success landed him the cover of the NME’s February 1979 issue. Enthusiastically adapting to the new dancehall era, Brown released a huge amount of work throughout the 1980s recording with genre’s major producers like King Jammy on Brown’s 1986 album The Exit and Gussie Clarke in 1989 with the Gregory Isaacs duet “Big All Round” and the album Unchallenged. He continued to record prolifically in the 1990s before his passing. His 1994 album Light My Fire and 2001 release Let Me Be the One were both nominated for a Grammy Award for Best Reggae Album.